Morning drive to Neemrana. Neemrana is an ancient historical town in Alwar district of Rajasthan, situated at 122 km from Delhi on Delhi-Jaipur highway in Behror tehsil. On arrival check at hotel Neemrana Fort and Palace. Neemrana offers a vibrant site for magical weekend getaways, feasts and celebrations, Overnight stay at hotel. Neemrana fort and palace is the 15th century heritage hotel is ideal to invent your own past at the dream site of history. Seven palace wings built over 12 layers tiered into a hill across 2.5 hectares / 6 acres of garden-palace, make Neemrana Fort-Palace one of the most unique resorts near Delhi! Hanging gardens, two pools to swim out to the horizon, an Ayurvedic spa, and India's first zip-line is what the world comes to experience. 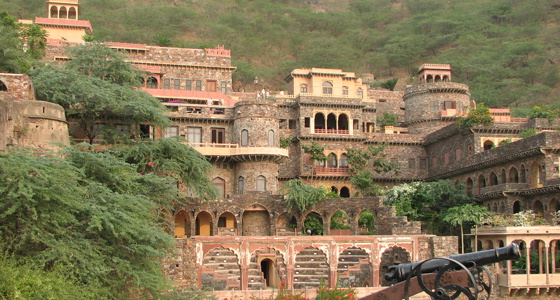 Neemrana Fort-Palace is not just a hotel. It is one of the most convenient holiday destinations amidst all the places to visit near Delhi. All efforts have been made to maintain the old charm of this palace and care has been taken to ensure basic comforts that have come to be associated with the changes in lifestyle since 1464. 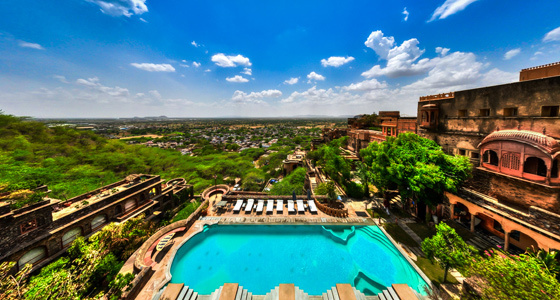 Neemrana offers a unique experience of seeing and 'living' history. Nothing about Neemrana is ordinary. On weekends, there are cultural performances organized by the Neemrana Music Foundation making Neemrana Fort-Palace an ideal location amongst the places to visit near Delhi. Besides India's leading dancers musicians, foreign artistes have also performed for guests & delegates. Neemrana is a unique destination as it is one of the only places to visit near Delhi which offers a wide range of activities such as camel cart rides, multimedia tours, vintage car rides and a thrilling zipping tour! Morning enjoy the Spa therapy in Raj Kund, the pool-on-the plateau, above the landscape to the horizon surrounded by many sun-deck terraces. Neemrana's Ayurvedic soothes the nerves and revitalises the stressed, urban body. A host of treatments, including those for detoxification and rejuvenation are offered. Post Breakfast enjoy the enjoy the Zip tour or Flying fox by the trained Guides and Instruments. Overnight stay at resort . After breakfast drive back to the Delhi.